Maud Johnston Giffin’s diary, 1938. My father collected what came his way, but he did not seem to know what to do with it. He was a busy man: a veteran of the Second World War, a medical doctor, a devoted husband, a pillar of the church and community, and a father of four children. After his mother passed away in 1942, he put her papers into an old dusty trunk in the attic. As youngsters my three siblings and I would rummage through the barrels, boxes, and trunks. We dressed up in old gowns and military uniforms. We wrote school papers based on family letters from the Canadian trenches and casualty clearing stations of the First World War. As children we knew all the battlefields: Ypres, Gallipoli, the Somme, and Passchendaele. We thought everyone’s attic was filled with such fun stuff. I never knew the magnitude of Maud’s accomplishment until 60 years after she finished working on it. 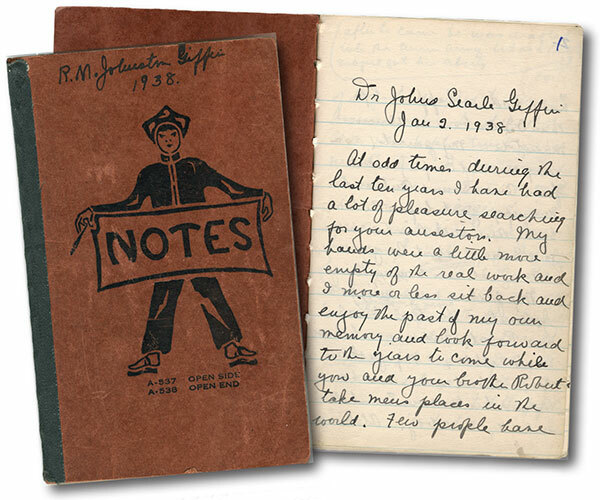 In the summer of 1998, just before he died, my father pulled a small brown Pilot notebook from a dresser drawer one afternoon and gave it to me with a typically laconic comment, “this is for you.” It was his mother’s diary of 1938; until then I didn’t know it existed. He didn’t tell me what to do with it. He knew I would read it, and that I could never just let it sit. I would have to find out more. He never told me that his mother and I were kindred spirits. The diary, a small, brown, notebook of 145 pages filled in neat, tiny handwriting with amazing details about her family: from the birth of her grandfather Joseph Johnston in North Ireland in 1798, his marriage to Margaret Wilson in 1829, their life in Ireland raising 13 children, their struggles during the great potato famine of 1845–51, the family migration to North America 1851–1873, settling on the tall grass prairie near Morden, Manitoba 1873– 1898, and of the family service to Canada during the Boer War 1898–1902 and the Great War of 1914–1918. Considering that she was writing in Superior, Wisconsin in 1938 before computers and Internet access to modern genealogical libraries and web-sites, it is an astonishing collection for its breadth and detail. Maud Johnston Giffin, a nurse graduate from the Freemasons’ Hospital at Morden, 1902. How and why did she take on such a Homeric task? It appears that she gathered most of her information from listening and talking with “the older generation.” There was no written Johnston genealogy in those days. The only hint that she gives is that as a child in Manitoba she spent her winter evenings wrapped in a buffalo robe before the fireplace absorbing old family tales. And, as a married woman she mined her husband’s grandparents and the local library of the Daughters of the American Revolution for similar information about the Giffin family reaching back to Colonial Boston and Halifax. Just now there are wars and rumors of wars, and a more terrible war has just been averted, though some people believe it is only postponed to a more evil hour. … You don’t remember the Great War (1914-1918). … I want you to understand what my people have been through. … At odd times during the past 10 years I have had a lot of pleasure searching for your ancestors. My hands are a little more empty of real work and I more or less sit back and enjoy the past of my own memory…. Few people have had a happier life…. I was born at Glencross, Manitoba (1878). My parents came to Winnipeg just before the boom … about the year 1871…. The Johnstons are Scots-Irish, Protestants from the lowlands of Scotland who settled in North Ireland during the Seventeenth Century…. A thousand more they’ll bide. In the seventeenth century the Johnstons joined the great migration of lowland Scots to North Ireland and eventually to North America (future generations would call them the “Scots-Irish”). In 1603 when the English Queen, Elizabeth I, died without a direct heir, the Throne of England passed to the Queen’s nephew, a Scot. King James Stuart VI of Scotland became King James I of a United Kingdom of England, Scotland, Wales, and North Ireland. The Lords of Scotland could not have been more pleased, and the new King was quick to reward them. On 16 April 1604 by Royal Decree James granted large portions of North Ireland to his Protestant supporters “for the purpose of planting colonies among the wild and unruly Irish (Catholic) population.” His generosity to the “Plantation Scots” resulted in another four hundred years of animosity and warfare in that troubled land. Unfortunately, the English attitude towards the Plantation Scots began to harden over time. Historian Charles Knowles Bolton describes the deteriorating life of the Plantation Scots in his book, Scotch-Irish Pioneers in Ulster and America. During the 18th century the English Parliament passed a series of Acts, forcing the Scots off their Irish land, out of their churches (Presbyterian), and out of local government. The English grip on North Ireland became so uncomfortable that a quarter million Irish Protestants (mostly Presbyterians) left Ireland for North America during the six decades before the American Revolution. My Giffin ancestors arrived in 1718 among the first boat loads of Scots-Irish immigrants to New England (but that’s a story for another time). The Johnston families were among the more fortunate of the Scots in North Ireland; they were Anglicans, firm supporters of the English Church and Crown. According to Russell Honey, the huge Johnston clan settled in the most remote and most dangerous corner of North Ireland, the “Lakeland” area of Lough Erne, Fermanagh County. The little village of Inniskillen (the spelling was later changed to Enniskillen) sits on a neck of land separating two lakes, Lower and Upper Lough Erne. All roads in the area led through the town of Enniskillen; whoever held the town controlled access to a broad area of North Ireland. In 1607 the entire area had been granted to Sir William Cole to build and fortify against the Catholic enemy in Southern Ireland. Sir William, his descendents, and neighbours successfully held the town against the “uprisings” of Roderick Maguire (1641) and the Jacobite assault of 1688. While defending their own town, the defiant soldiers of Enniskillen harassed the attackers of Londonderry and helped eliminate Catholic resistance in North Ireland. In recognition of their invaluable contribution to the English Throne, Enniskillen was given the honour of providing the personal bodyguard for King William of England at the Battle of the Boyne in 1690. In her diaries Maude wrote, “everyone from Enniskillen was a staunch Anglican … (and) related to the Noble 600.” At first I had no idea what “Noble 600” she was talking about. An “Anglican” is a member of the Church of England (or, an Episcopalian in the United States). We “Anglicans” are not generally described as “staunch…” Most Scots and “Scots-Irish” are Presbyterians, congenitally opposed to the English Church. What was Maud saying? And, who were the “Noble 600”? and he rode on ahead, as he waved his blade. To the gallant three hundred whose glory will never die…. Lost are the three hundred of Scarlett’s Brigade. The “Enniskillens” were from the old home town. With a little more research I discovered that the town had not only supplied King William’s personal guard at the Battle of the Boyne (1690), but also it had provided two famous regiments to the British Army ever since, the Enniskillen Fusiliers and the Dragoons, the “Brave Inniskillens” of Tennyson’s poems. The people of Enniskillen were Anglicans and loyal supporters of the Crown. Great grandfather Joseph Johnston (1798–1885) lived through the violent years of the Napoleonic Wars. He was born the year the English crushed Napoleon’s fleet at the Battle of the Nile (1798), and he was 17 years of age the year Wellington defeated Napoleon at Waterloo (1815). According to Maud “he was lucky to have missed the King’s pressmen.” Enniskillen provided a continuous supply of young men to the Protestant Armies of a United England and North Ireland since the 17th century. And, the King’s military recruiters were notoriously eager to grab young men out of the fields and off the streets whenever new recruits were needed. Margaret Wilson (1810–1895) and Joseph Johnston (1798–1885) are buried at Glencross Cemetery outside Morden. Joseph Johnston was a farmer and cattleman who worked 35 acres of land leased from the Earl of Enniskillen, Lord Cole, a direct descendant of Sir William Cole founder of the Protestant plantation in Fermanagh County. According to his granddaughter Maud, “Joseph was a tall, stern man, a stout Anglican and a staunch Orangeman” (a supporter of the English Throne and the Protestant plantations in Ireland). Between 1830 and 1858 Margaret and Joseph would have thirteen children (ten sons and three daughters): William, Ann, Andrew, John & twin Robert, James, Thomas, Joseph, Margaret, Alexander, Adam, Henry, and Ellen. They were highly successful parents as all thirteen lived to adulthood through the famine years in Ireland and all migrated successfully to Manitoba. Johnnie and Uncle Robbie were the 4th and 5th of 13 children in the family…. The twins were mischievous little tots, always pulling off each other’s bonnets, and occasionally getting into more serious trouble. … At the age of 3 they had been left alone in the house for a short time, just long enough to find a bag of precious grain. Margaret returned to find a trail of grain through the house. The twins had been waddling between the bag and the fireplace, tossing handfuls of grain into the fire until the sack was empty and the fire had gone out. Not only had they wasted this precious grain but this was an age before matches. If the family fire went out Margaret had a long walk to a neighbor’s home to borrow hot coals. And, a long run home while the coals were still glowing enough to restart the fire…. There were other narrow escapes when the boys discovered trout in Lord Cole’s private fishing preserve, the Arney River. No one could throw in a line without an invitation; and the young Johnston boys never saw one of those. But they fished anyway… Many a time the boys would dash into the house, toss their caps aside and sit coolly unconcerned as Lord Cole’s watchman banged on the front door. Their father would pay no fine if the boys were caught — they would have to suffer the consequences which meant imprisonment or transportation (exile to Canada or Australia)…. But they were never caught…. At the age of seven (1843) the twins were breeched [given adult pants and separated more from their mother’s care]…. and sent for schooling to a stern old disciplinarian, a veteran of the famous Inniskillen Dragoons. Master Scarlet had been wounded at the battle of Balaclava. And, he trained his school boys as he had been trained for the Army with a leather strap. Her father carried a scar on his neck from one such training session. Unfortunately Maude may be confusing her father’s schoolmaster “Scarlet” of 1843 with the Scarlet in Tennyson’s poem about the Battle of Balaclava (1854). Sir James Yorke Scarlet Commanding General of the Heavy Brigade at Balaclava was born and raised in Lancashire England, not Fermanagh North Ireland. Perhaps the boy’s school teacher in Ireland was a different Scarlet, a veteran of an earlier war. Flax was grown on the farm and girls were hired from the mountains to “scutch” it and soak it in water and pound it to prepare it for spinning. This process broke the hard shell surrounding the white strands inside the flax straw of which linen is made. Cattle were also kept on the farm, and Margaret received great commentating for her butter. Her husband had built her a fine milk house and there was a spring bubbling up continuously in it so that everything was kept cool. Everything had to be spotlessly clean… noggin and trenchers (wooden cups and plates) were used for utensils. A little pan was a skillet … the cow barn was the byre. Not only did the women have to get the flax ready for spinning, but they had to spin it and then make it into cloth. They also had to make candles to see by at night… they had moulds whereby they put a piece of cord through the center and then filled it with tallow. This is the time when you hear the rhyme, Man works from sun to sun, but a woman’s work is never done. …The words famine and starvation came to have a meaning that later generations would never know. Beggars soon appeared at the door, starving children, the poor, emaciated, and elderly. Then whole families appeared at the door actually starving. The poor had nothing to eat and could only beg for help from neighbors who had little themselves…. All left an indelible imprint on their memory that could not be erased. …No one was ever turned away from our grandparent’s door; somehow food was provided and extra work was found. Joseph was tender-hearted, he could always use help. His fields needed work, and his cattle had to be tended, slaughtered, and dressed…. Margaret hired women from the mountains to help churn her butter and harvest her flax. They helped soak the flax in water and then scutch it (work it) to separate the fibers. She kept several women busy on spinning wheels making thread. And she hired local men to help her weave and bleach white linen shirt cloth. A serious parent with several children (like Joseph) must have spent considerable time pondering his family’s future. What future was there in Ireland when the country was unable to feed itself? Why train ten sons to be farmers when his 35 acres barely supported his own family? There was little hope the boys would be able to lease additional farm land as they started families of their own. The oldest boys (William and Andrew) were already farming with their father, but it was not too late to arrange apprenticeships for his younger sons in other useful professions. Perhaps it was time to make serious plans to leave Ireland for lands of greater opportunities overseas, possibly North America or Australia? During the famine years Joseph and Margaret began to spin together a closely knit family unit that was frugal, self-reliant, and resourceful. When they moved to North America they would bring everything needed to survive and flourish on the tall grass prairie of Manitoba. They knew how to raise, shear, milk, and butcher cattle and sheep. They could grow, scutch, bleach, spin, and weave flax into linen clothing. They could build houses, barns, and stone walls; and, they could forge and repair almost any tool needed on a ranch or farm. The first stages of Joseph’s plan for migration began in 1849. That year the twins were 13 years old, the age when the sons of a yeoman (a freeman able to choose his son’s occupation) would typically begin working full time for their father, or they would be sent out as apprentices in another profession. If the family was to be successful in North America, his sons would need a broader range of skills than just farming. At 13 the twins were assigned apprenticeships, John with a local cabinet maker and his twin “Robbie” with a stone mason. Another of the sons, Alex, would go to work with the local police force. And, in 1851 the oldest son William was dispatched to scout out farming opportunities in America. In all likelihood William was given sufficient family cash to purchase land and start a farm in New England. He settled on a “market garden” property at Woburn, MA about ten miles north of Boston. From there he began providing fresh produce to the markets of Boston. Irish and American newspapers at the time carried advertisements and personal letters encouraging potential immigrants of ship sailings and “grand opportunities” in the New World. For decades we’ve had such a letter among our family papers. Tucked away in an old family Bible we’ve had an enigmatic family letter written in 1866 in a strange dialect of French. The letter is addressed from Moutier, Switzerland to Constant Chevalier a distant (maternal) relative in Iowa. Unfortunately, no one seemed to be able to read the letter. After decades of searching we found a translator through the French Department at Smith College in Massachusetts. Nicole Ball volunteered to take on the mysterious French dialect. After struggling with the letter for weeks, Nicole reported that the problem was that “… the man who wrote the letter was quite illiterate as is obvious by his (fractured) spelling, syntax, and total lack of punctuation.” We don’t know the name of the mysterious author of this 4-page letter to a distant maternal grandfather as he failed to sign it. But, we know what he wanted. He wanted very much for the family to help him migrate from the small watch-making village of Moutier, Switzerland to Iowa. Dear Constant … I am hurrying to send you the [watch] jewels you asked for, and 5 pairs of hands…. If you could possibly help me make my passage [travel expenses], I will bring enough [watch supplies] to pay for it. I could then earn enough to have my family come over. I don’t like it in Moutier anymore, it’s not possible to make enough [money] … all the watch makers are sick of working here; the factory is not worth anything…. The bosses are greedy to the core. Half the workers would like to be able to go to America. That’s all people talk about here…. If I could only get to you I would be rich enough…. … The Johnston boys were soon getting restless. By 1857 John, Robbie and James had convinced their father that it was time for them to join their brother William in Boston. We do not know what route they took to Boston, but we can make an educated guess. It has been said that the poor sailed from Limerick, and those who could pay for their passage sailed from Dublin. Being on the wealthier side of that equation, it seems likely that they sailed from Dublin. Johnnie Johnston would later use Dublin names for his hard scrabble Manitoba property. He named his ranch Phoenix Park, after the magnificent city gardens of Dublin; and he called the muddy little stream that crossed his property the Liffey after the broad river that carried boatloads of Irish out of Dublin to the lands of opportunity in North America. According to family records, the three boys arrived in New York on 6 September 1857. The boys must have been amazed at the hustle and bustle of the city, and of the sights on their way to Boston. Maud records that her father John wrote home to Ireland about an enchanting afternoon concert at Tremont Temple Boston listening to a memorable performance by the gorgeous Swedish Nightingale, Miss Jenny Lind. … There weren’t many jobs for cabinet makers in Boston at the time. John found the town bursting with immigrants and it was hard to find work of any kind. He worked for his brother William for a while, but …he wasn’t much of a vegetable farmer…. He knew cattle; he loved horses; and he was a good driver. So he applied for a job with a wealthy Boston family as their coachman…. He worked for the Appletons for several years, until his quick Irish temper got the better of him…. One day he overheard Mrs. Appleton referring to him as the servant and he could no longer endure it. He almost quit on the spot and left her without a ride. But he relented, long enough to get her home. By then it was 1863 and the American Civil War was approaching the worst of its destructive rage. That summer Confederate armies probed deep into Pennsylvania. In a panic the Union army began drafting tens of thousands of young men. Replacements were desperately needed to feed the slaughter at Gettysburg. Riots broke out in the cities. Maud records in her Diary that her father “… was drafted into the Union Army but he was able to use his British citizenship to avoid the bloodletting. By the fall of 1863 John and his twin Robbie used their British citizenship to leave Boston for a more peaceful land.” By then they had an option in Canada. Two years previously (1861) another of the Johnston sons, Andrew and his new bride Anne had left Ireland for Canada. Andrew had settled and was working a farm near Owen Sound, at Keppel Township, Grays County, Ontario. Without a doubt Andrew was writing letters to the family in Ireland and to his brothers in Boston. Prospects for the Boston brothers (John, Robbie, and James) were much better in Canada than in Mr. Lincoln’s Army. So in 1863 after several years in Boston with little to show for it, the three brothers migrated north to join brother Andrew at Owen Sound. The oldest brother William stayed behind in Woburn to run his farm. He would join them later. … They settled in Wiarton, Ontario for a while where they found work pulling stumps from fields and helping raise new barns for local farmers It was hard work but John was soon distracted. He fell in love with Rachel Shaw, the daughter of the local school teacher…. The Shaws were Scots-Irish Presbyterians from Armagh County, North Ireland. Rachel Shaw’s father, Gavin was an educated man, a teacher. According to family tradition Gavin Shaw’s father was distantly related to the famous Irish playwright, George Bernard Shaw (born 1856). Unfortunately any such connection probably goes back to a far distant time, perhaps as distant as the Battle of the Boyne (1690). George Bernard Shaw was directly related to a Captain William Shaw who had fought at the Boyne, for which he received a large land grant from King William in Kilkenny County in the South of Ireland. Quite possibly the predecessors of Gavin Shaw had also fought at the Boyne, although such a connection has not come to light as yet. George Bernard’s ancestors were wealthy Anglican land-owners in the extreme south of Ireland at Kilkenny. Our ancestors, the Shaw’s of Armagh were Presbyterian tenant farmers in the extreme north of Ireland. The Shaws. 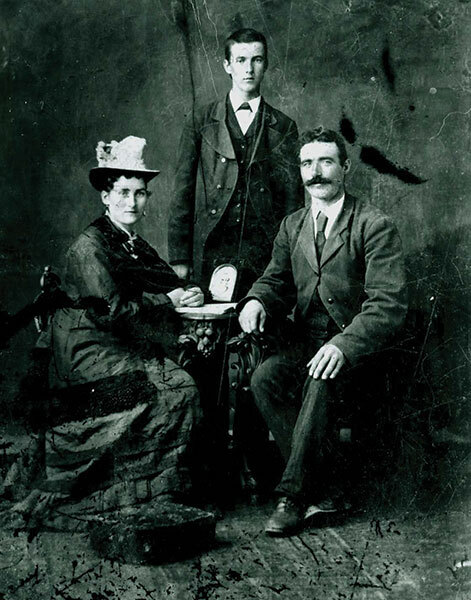 This tintype from around 1860–65, shows recent Irish immigrants (L-R) Robert, James, and Susan Shaw. According to the family genealogy, in 1861 Gavin Shaw of Armagh sold his sheep, left his rented land in Ireland, and migrated to Canada with his wife and eight children: Benjamin, Gavin Jr., William, Eliza, Robert, Rachel, Susan, and James. His daughter (my great grandmother), Rachel Shaw, was twelve years old at the time. She later would tell her daughter Maude that “the family spent 14 weeks on a storm tossed sea sailing to Canada, a trip she would never forget”. Unfortunately she didn’t provide us with any details. In good weather the average sailing time would be 4–6 weeks, so they must have had a stormy time of it. We have an early tintype of the three youngest of the eight Shaw siblings (Robert, Susan, and James). The image appears to have been taken a decade after their arrival in Canada. Great grandmother Rachel Shaw (Johnston) would have been the oldest of this group of siblings, but she is not in the photo. She was twelve when she arrived and Robert would have been 1–2 years younger. In the tintype, Robert looks to be at least 20 years old with his stylish moustache, tie, and three-piece business suit. Susan, seated in the photo, is fashionably attired in a multi-layered, black linen gown with a pot of flowers for a hat. The youngest brother James looks like he is ready for Eton (or perhaps a somewhat less expensive Irish or Canadian college). The Shaws were educated people. It is possible that the Shaw family crossed the Atlantic on the same ship that brought another Johnston brother and his bride to Canada. Andrew and Anne Johnston were married in Ireland and migrated to Canada in 1861. They settled in the same town in the same year as Gavin Shaw and his family. They certainly knew each other; it was a small town. And, the families would soon intermarry; some of the Shaws would join the Johnstons in Manitoba. Grandson William Purvis also found a wonderful description of the Hibernia. She was a 3,000 ton, iron-screw steamer, built at Dumbarton, Scotland in 1861. Joseph and Margaret were traveling on one of the faster, more comfortable passenger ships; another indication that they were relatively “well to do” compared to other immigrants at the time. … John and Rachel lived with her parents in Ontario for a while. Their son Joseph was born in January 1869. And then John and his twin Robbie got restless again…. Father said he had a strong desire to put his feet under his own table…. His one ambition was to own so much land that one could not see it all with one glance of the eye…. He would keep looking. Sometime in 1869–1970 they moved west to Prince Arthur’s Landing [later Port Arthur, today Thunder Bay, Ontario] where the brothers hoped to work together as contractors building homes. At the time it was not an attractive place as the forests around Port Arthur had been devastated by wild fires in the late 1860s…. John began hearing stories of greater opportunities to the west along the Red River…. Under the terms of the Dominion Land Act of 1872 settlers to the new Province of Manitoba could acquire free land if they would establish homesteads and farms. John decided to venture westward with his wife and two children. John’s twin, Robbie returned to Owen Sound to find a bride. 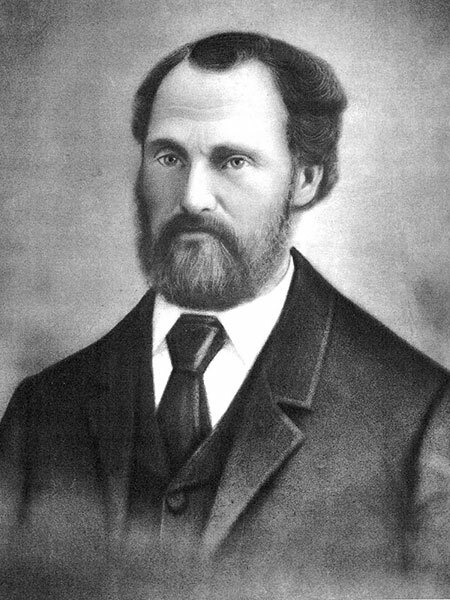 Sandy traveled west with Col. Wolseley’s Red River Expedition on the overland route from the Ontario lake-head, arriving in Winnipeg in 1870. He worked for a time for Ballentine’s Wholesale and Supply Company, a Winnipeg firm. 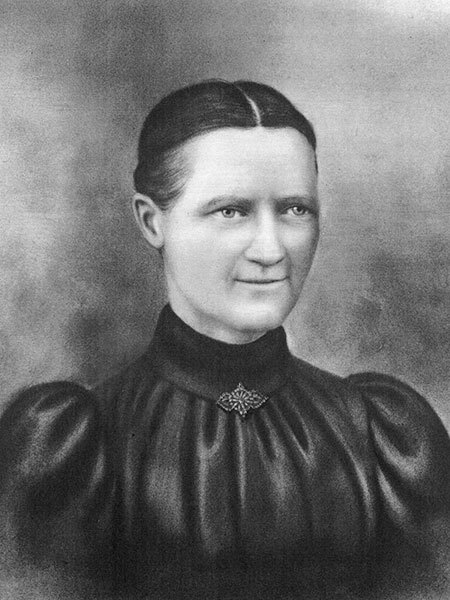 Rachel Shaw Johnston (1849-1900) migrated with her parents from Armagh, Northern Ireland to Canada circa 1861. John Johnston (1836-1898) migrated from Enniskillen, Northern Ireland to Boston in 1857 and on to Winnipeg and Morden around 1873. How did a family with two young infants travel across the rugged Laurentian Shield and into Manitoba? In 1873 the Dawson Road across Canada was useless as an immigration route. The family genealogy mentions that “they traveled by flat bottomed boat to Manitoba.” It seems most likely they followed the route taken by W. F. Butler in his 1870 trip to Winnipeg. Butler traveled first by steamboat down the Great Lakes to Chicago, then by railroad north to Milwaukee (Wisconsin), where he transferred to another railroad traveling west to Prairie Du Chien (Wisconsin), then by steamboat across the Mississippi River to the town of Macgregor in Iowa, then by train again to St. Paul (Minnesota), where he transferred to another railroad traveling west to Georgetown on the Red River, and finally by steamboat up the Red River to Pembina on the Canadian/US border and on to Winnipeg. … In the summer of 1873–1874 John and Rachel arrived in the muddy little village of Winnipeg. They must have been exhausted. 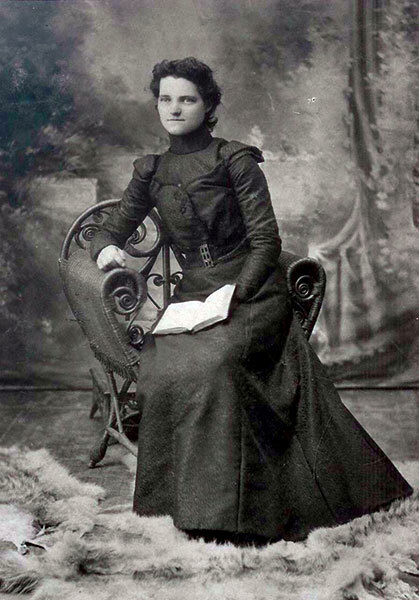 They had two young children (Joseph and Susan), and Rachel was soon expecting a third (Margaret born 5 August 1874)…. With every rainstorm the town became a sea of red, sticky, mud… tenacious stuff that coated everything and left a permanent stain on clothing even after brushing and washing. Rachel remembered the shrieking of the Red River carts as they passed down Main Street in Winnipeg caked with mud. The carts were made entirely of wood, great square boxes balanced on a single axle with a pair of five-foot wooden spoke wheels, all pulled by an ox or a horse. But she couldn’t give way to it—she first nursed one child and then another through the long weary fall.” Winter came at last and the sickness broke. Somehow they all survived, but it took baby Margaret four years to learn to walk. The Johnstons were strong Episcopalians. Mother was brought up Presbyterian…. My parents compromised by joining the Methodist Church so as to have a family Church…. The denomination of a Church means so little to me as there is so little difference in the fundamental things in the Protestant world… I do dislike the emphasis placed on Baptist, Methodist, and Presbyterian…. I like them all. I do remember father telling of Indians he had seen in Winnipeg who told stories of how they had surrounded, killed and scalped travelers in ‘49 as they were going westward in covered wagon days in the US. One blood-curdling tale was of a woman with long, fair hair who drowned in a river rather than face being captured. The Indians marveled at the hair, as they had never seen anything like it before among their raven-haired squaws. I listened with baited breath without my father noticing me…. he just could not sit still while the brave told about it… he said he felt like striking him in his tracks and choking him as he gloated about the fiendish tale. … The soil was a dark, rich loam and they were the only family in the area at the time. There were oak, ash, elm and box elder along a nearby stream. John spent that first summer felling trees and building a log cabin while the family lived in a tent. By fall there was an abundance of fat, juicy berries hanging on the haw bushes along the creek. They named that muddy little stream Liffey Creek, and their new home Phoenix Park. The rest of the family must have had a good laugh over those prophetic names. The phoenix was the mythological bird that rises from its own ashes. Maud records that the ranch was built on deserted and recently burned-over land. At the time great fires would periodically sweep across the prairie, fires ignited by lightening, or by settlers clearing their land, or by Indians attempting to drive animals towards their hunting parties. Their new home would “rise from the ashes” on the banks of Liffey Creek in Manitoba. The Liffey River in Ireland winds through Dublin, past its magnificent city garden Phoenix Park, along its docks and wharves, and into the Irish Sea. The broad Liffey carried the family and thousands of other Irish families out of Dublin and off to America. The land of “golden opportunities” for the Johnston family began on the scorched banks of a muddy creek on an inland sea of tall grass in Manitoba. Sometime about 1880 Joseph and Margaret Johnston posed proudly for their portrait. 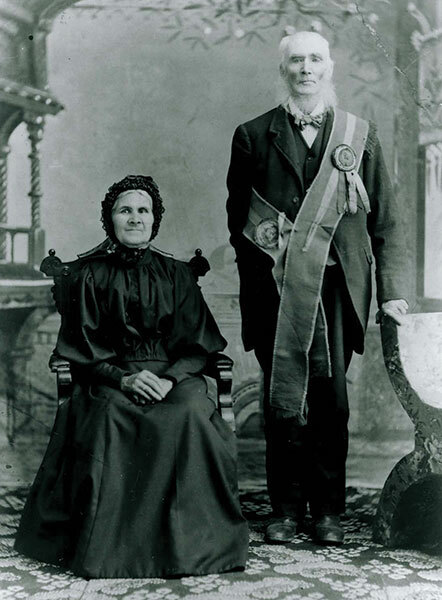 Joseph stands rigidly erect; proudly wearing the bold sash of the “Order of the Orange.” His wife Margaret sits beside him with the wise, tolerant smile of a woman who has overcome considerable obstacles in her lifetime. They had good reason to be proud of themselves. Their entire family had survived the Famine and successfully gathered about them in Manitoba (William the oldest son joined them in 1891). The family had traded 35 acres of rented land in Ireland for thousands of acres of rich Manitoba prairie land. Of course transforming that tough prairie sod into some of the richest farm land in the world would take decades of hard work. But that too is a story for another time. 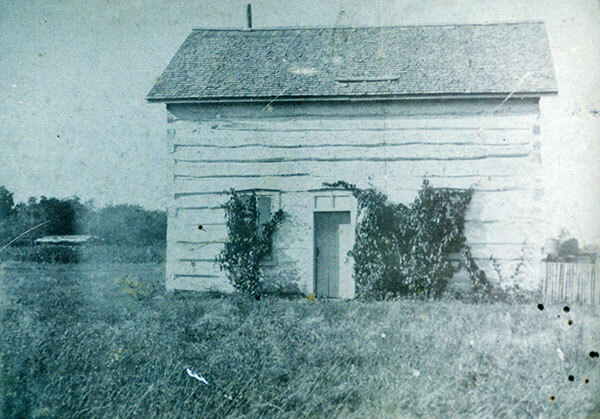 The home of John and Rachel Shaw Johnston at Glencross, Manitoba, circa 1900. 1. Johnston, Maud. “Diary of the Johnston Family.” 1938. An unpublished family history. The original is with the author in Portland, Oregon. See note #2 below. 2. Giffin, Susan. “Diary of the Giffin Family.” 1938. An unpublished family history. The original is with Susan Giffin in Detroit, Michigan. See note #12 below. 3. Stacey, A. G. The Johnston Family: Joseph and Margaret Johnston and their Descendants. 1994. An unpublished manuscript circulated among the family by Allen Stacey (deceased) of Winnipeg. 4. Honey, R. C. The Gentle Johnston/es. Canada: Fallsbrook, 1996. 6. Leyburn, J. G. The Scotch-Irish: A Social History. Chapel Hill: University of North Carolina Press, 1962. 7. Bolton, C. K. Scotch-Irish Pioneers in Ulster and America. Boston, 1910, pp. 13–17. 9. Tennyson, A. The Works of Alfred Lord Tennyson. New York: Macmillan. 1901, pp. 217, 556. 10. Foster, R. F. Modern Ireland 1600-1972. New York: Penguin, 1988, pp. 319, 321. 12. Thompson, S.P. “As I remember.” 1952. An unpublished family memoir by Susan Thompson and Edna Craig. pp. 2–3. Shared with the family by Annie Blight. 14. Harris, J. The Gallant Six Hundred: A Tragedy of Obsession. New York: Mason, 1973. 16. Chevalier, Constant. “A family letter of 1866 addressed to Constant Chevalier of Waterloo, Iowa.” 2008. An unpublished family letter in French, the original and translation is with the author in Portland, OR. (Nicole Ball, translator). 19. Butler, W. F. The Great Lone Land: An Account of the Red River Expedition and Other Travels and Adventures in Western Canada. Edmonton: Hurtig. Reprint 1968. 20. Howard, J. K. Strange Empire. St. Paul: Minnesota Historical Society Press, Reprint 1994, pp. 198–204. 22. Butler. p. 30 and Howard. pp. 184-185. Both authors give vivid descriptions of early Winnipeg and of the assistance given to new immigrants by the Rev. George Young. 23. Stacey. The family genealogy defines the land grant as Section 1, Township 2, Range 5 – West of Principal Meridian (1874: SW ¼ section 4 & 1884: SE ¼ section 3).